After getting off the phone with your manufacturer in China, you dial in a video conference to your CFO in London. Cloud phone systems not only make this possible, but much cheaper than using a traditional phone line. Cloud phones use voice over internet protocol (VoIP). VoIP transforms your voice into digital signals that can be sent over the internet. This avoids expensive long distance fees. 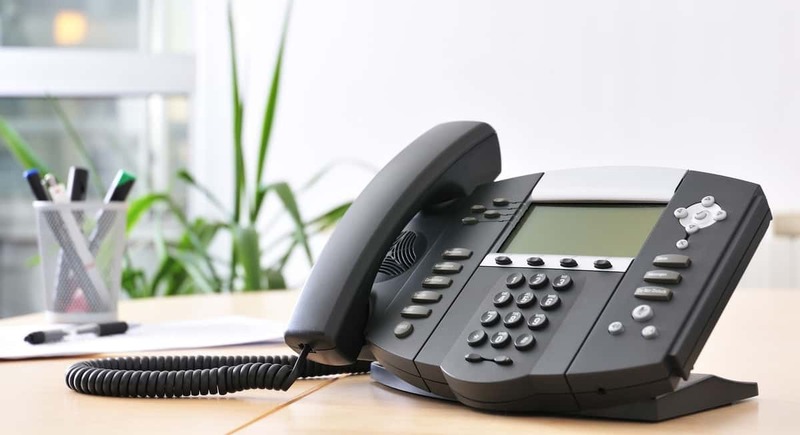 This article will teach you everything you need to know about small business phone systems. Not only that but VoIP phone systems for businesses are one of the easiest ways to simplify operations. Instead of maintaining separate networks for your phone and internet, everything will be integrated into one system. And VoIP becomes even more convenient when you let your cloud service provider handle all the maintenance. We’ve come a long way since the days of analog, but company phone systems are still as important today as ever. Before anything digital came along, analog phones got the job done just fine by converting voices into electric signals. For businesses, both analog and digital phones can be controlled by different systems. If you’ve ever had someone transfer your call or transferred someone else’s call to someone in your office, there’s a good chance you’ve used a PBX system. A PBX system is best for a business with only about 5-40 employees. This is because it is one of the most expensive options when it comes to phone systems for small business. At $800-1K per user, a PBX system wouldn’t be worth the money if you have under 5 employees. But you do get a lot of features for that price. A good PBX system can multitask better than a single mother with 5 kids. PBX systems can handle computer-telephony integration (CTI), voicemail, and other features that make it a worthwhile investment. A key system is almost identical to a PBX, except with less customizable features. They are also often cheaper, at about $300-1K per user. Key systems work best for companies that don’t need all the extra functionality of a PDX. A PDX requires fewer outside lines than the number of extensions it has because not all lines are used at once. A key system has to have the same number of outside lines as it has extensions. Small business phone systems don’t always have to be expensive. The best option for businesses with less than 10 employees, a KSU-less system doesn’t have a central control unit like the other two options. Instead, each phone has the capability of connecting to other phones in the network. This lack of a central control unit makes them portable and cheap. At only about $100-250 they are the cheapest option for a business phone system. While groundbreaking at first, it didn’t take long to realize that even with a huge network of cables and wires, analog signals proved to be insufficient for the massive demand for phone lines. Like every other modernized industry, small business telephone systems went from analog to being online. A VoIP phone system for small business acts as that company’s own personal cloud phone. VocalTec, an Israeli telecom company, introduced the first VoIP phone that became popular with consumers. For the next several years they worked on new features, like voicemail, to add to their internet phone service. By 1999, VoIP went corporate. IT firm Teledvance formed in order to take VoIP technologies to the enterprise level. VoIP went from being a cool new way to call your relatives across the country to the best way for a business to manage its phone network. By 2003, over 25% of all voice calls made were over VoIP. Cloud phones are sometimes called “hosted PBX services” because they offer all the functionality of an expensive PBX system. Paying a large sum upfront for an on-site PBX system that needs professional installation may not be an option for your business. You can instead rent the equipment and services you need and pay as you go for your business phone systems. An onsite VoIP system’s main advantage over the cloud is that there is no risk of your fees increasing. That benefit gets outweighed when you start scaling your business. When you need to expand your phone network, an onsite system proves to have the same problems as managing onsite servers. You’re going to need to buy more equipment, pay more to maintain it, and each time you reach the limits of your VoIP system you will have to spend more money to meet demand. Anyone that has run a successful business knows the pain of growing too fast. Handling two or three times the normal volume of customers you have can wreak havoc on your current infrastructure. The cloud dumps all the responsibilities of running a phone network onto your service provider. With the cloud, a small company can provide the same level of service as a large business with its own in house VoIP system. And the same goes for slower years. An onsite setup has the same upfront cost regardless if you are making enough money year-round to justify spending that much. Because you pay as you go with the cloud, you’ll spend less when sales are down. You’ve seen how much money you can save using a cloud phone. Small business phone systems are so much easier to manage when the cloud provider does most of the work. Don’t let traditional phone lines stunt your business’ growth. With a VoIP cloud phone, you can start saving money today! Read this article now for the 7 reasons your business needs a cloud phone. Switch to a cloud phone today and pay as you go.